Over the past five years, if you have contacted the UConn Library MAGIC and/or the Connecticut State Data Center either virtually or in person, you have likely had an opportunity to interact with our graduate assistant Weixing Zhang. 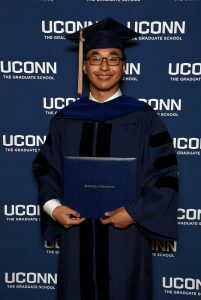 At the end of Spring 2018, Weixing Zhang graduated with his PhD in Geography from the University of Connecticut! During Weixing’s tenure at both the UConn Library MAGIC and the Connecticut State Data Center, he has assisted users on a number of data requests, developed custom maps, developed scripts to process and visualize data, and contributed or led a number of projects and initiatives. One of the largest and most in-depth projects Weixing helped make a reality was developing the 2017-2018 release of the 2015 to 2040 Population Projections for the State of Connecticut, a project which involved over 2.5 years of research, analysis, and working with multiple collaborators before the final projections could be developed and published to the Connecticut State Data Center and Connecticut Open Data websites. Dr. Weixing Zhang is one of a series of graduate assistants and undergraduate interns which the UConn Library MAGIC and/or the Connecticut State Data Center has had the opportunity to work with to develop resources and provide assistance to our users. We are especially appreciative of the Office of Policy and Management, UConn Department of Geography, and the UConn Library for making these graduate assistantships and internships possible. Thank you Dr. Weixing Zhang for all your hard work, dedication, and collaborative initiatives you contributed to at the UConn Library MAGIC and the Connecticut State Data Center and we wish you well and best of luck on your new adventures post graduation! This entry was posted in CTSDC, magic, Uncategorized by . Bookmark the permalink.